Everything you need to know about about Paul McCulley too. Are you keeping an eye on GS vs. Aleynikov? That's a fail? I could care less about which economist is the biggest loser. If it was a prediction, predictions of that quality are a rare as hen's teeth. Seems like 'full of fail' is the new nailing it on the head. Huh? In the 2002 column he said that by only blowing up a housing bubble could the Fed avoid a dip back into recession. We got a housing bubble and avoided a double dip. What part of this is a fail? 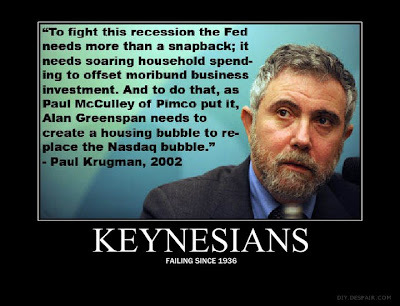 Given the obviously negative connotations of the word "bubble" -- and this was as true in 2002 as it is now -- it is somewhat unclear what Krugman means exactly in his column. Of course Eric is of the belief that investors could not possibly have been foreseen by rational investors, and that regulators are impotent to change the "culture" of financial institutions. In other words, liberal policies are completely ineffectual, except when something bad happens, when suddenly they magically become strong enough to absorb 100% of the necessary blame. s/b "Of course Eric is of the belief that the housing bubble could not possibly have been foreseen by rational investors"
"The basic point is that the recession of 2001 wasn't a typical postwar slump, brought on when an inflation-fighting Fed raises interest rates and easily ended by a snapback in housing and consumer spending when the Fed brings rates back down again. This was a prewar-style recession, a morning after brought on by irrational exuberance." I suspect 9/11 had a bigger impact in driving Fed rate cuts and the bubble than Krugman's or McCulley's punditry. I blogged about that last year ("Did 9/11 delay an economic day of reckoning?"). 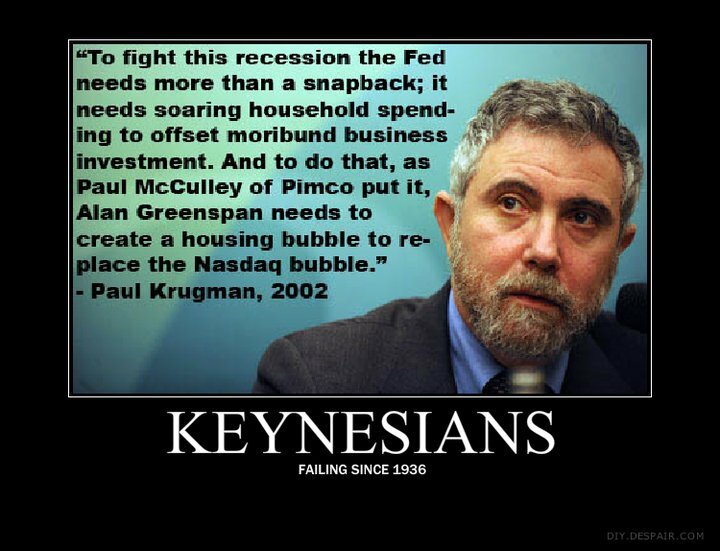 There seems to be confusion on whether krugman was predicting or advising a housing bubble. Some simple web research showed that much was written about this column, and it turns out he was predicting a housing bubble and not happy about it. The message was meant to be sarcastic. Arnold Kling talks about it and defends krugman here.